The Syrian opposition in southern Syria has achieved significant gains in recent weeks. Rebel groups from across the ideological spectrum, often coordinating their operations against the regime, have been targeting strategic military installations and urban centers, seizing key access points on the border with Jordan and the Golan, and gaining rural territory as the regime withdraws. These gains demonstrate enhanced coordination between groups associated with the Supreme Military Command (SMC) and other independent groups. They also demonstrate the ability of the opposition to reassess failed strategies and apply “lessons learned” from the successes and failures of previous operations elsewhere in Syria. They will not only have an impact on regime operations in southern Deraa and al-Quneitra provinces, but will also lay the groundwork for the decisive battle for Damascus. Most importantly, the Martyrs of Yarmouk brigade captured the 38th Division Air Defense Base along the Damascus-Amman highway on March 23 [Map Point 3]. Their efforts were aided by reinforcements from other rebel groups including Jabhat Nusra. Not only was the Air Defense Base located along a major highway, but the opposition captured a number of military vehicles and storehouses of weapons and ammunition, depriving the regime of 60 fully loaded containers including a cache of Cobra missiles for the Air Force. Syrian MP Walid al-Zoubi conceded the significance of this loss to the regime in a speech to the Syrian Parliament in which he said “the most important military position” in the region fell because the regime lost control of the highway from Khirbet Ghazaleh to the border [Map Point 4]. Other groups have been active in Deraa province as well. On March 29, rebel units led by the FSA-affiliated Fajr al-Islam Brigade, capturing the town of Dael. [Map Point 5] The town is strategically located on the north-south highway that connects Deraa to Damascus and has a population of approximately 40,000. If the opposition is able to retain control of this area, it will increase their control of strategic junctions in Deraa province and restrict access to the provincial capital from the north. The rebels now reportedly control a 25 km swath of territory adjacent to the border with Israel. The fighting and loss of regime control along the Golan has brought the conflict closer to home for Israel and in some instances has drawn a swift response. When the IDF assessed that one of their patrols was being targeted by machine gun fire on March 24, the army responded by destroying the machine gun nest with a Tamuz anti-tank missile. In the past, Israeli Defense Minister Moshe Yaalon had promised to “immediately silence the sources of fire when they are identified,” and this incident demonstrated his resolve. The uptick in violence in the area since early-March, as well as the demonstrated vulnerability of UNDOF and the resulting scale backs to its capabilities, suggests that these cross-border disturbances are likely to continue as the U.N Security Council fears. Although control of these key points into Jordan gives the opposition better access to the flow of weapons and aid reportedly facilitated by the west, it also affects the flow of refugees in both countries. The Zaatari refugee camp in Jordan, which housed an estimated 146,000 refugees in early March, experienced riots on March 28 when refugees trying to return to Syria were not allowed to leave the camp due to violence on the other side of the border. As these conditions fuel border tensions, how the armed opposition responds to the responsibility that comes with control of the border may help demonstrate whether the SMC is able to influence the armed opposition across the entirety of Syria. The Assad regime is not defenseless however, and consolidation of Deraa province under rebel control is not complete. Because of its proximity to Israel, the province historically has a higher number of brigades than any region in Syria other than Damascus. As a result, army facilities and air defense sites litter the countryside between cities, providing pockets of resistance for the regime. In the same speech where he commented on the loss of territory in Deraa province, Syrian MP Walid al-Zouhi stated that “we are only protected from the west by Base 61,” referring to the 61st Mechanized Brigade headquarters located near Nawa. The regime also controls the nearby Suwayda military airbase and the substantial military territory north of Khirbet Ghazaleh that stretches to southern Damascus. Deraa, the provincial capital, is still under regime control as well. When these advances are examined in aggregate, the opposition’s overall strategy of seizing entrenched regime positions by first targeting their lines of support becomes clearer. The opposition in the north has been using these tactics in their recent campaigns against regime air force bases and military compounds in Aleppo and Idlib, where they have focused on attacking the military outposts that defend these entrenched positions before launching concentrated attacks against them. The ongoing sieges of the Nayrab airport in Aleppo and the Wadi al-Deif military compound are excellent examples of this approach. 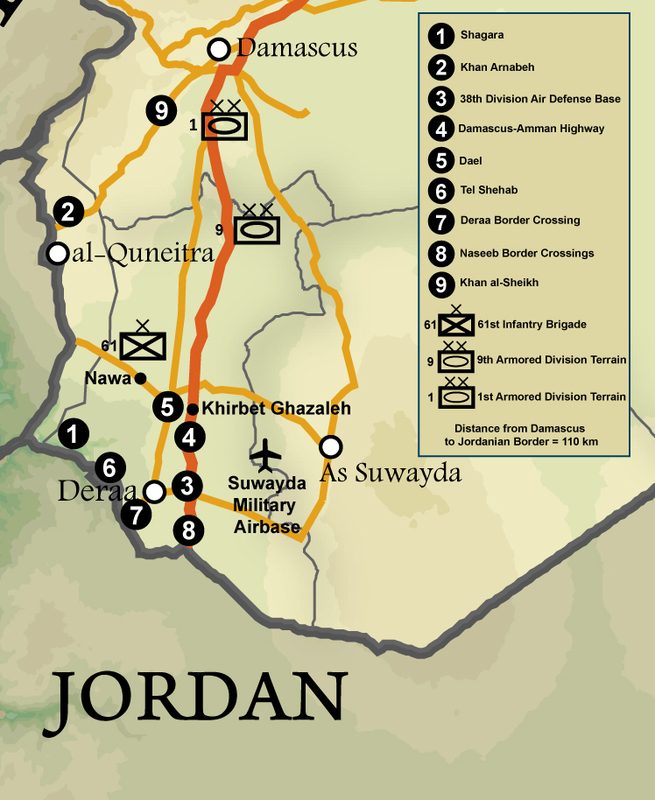 The most significant of these gains in the south, namely the capture of the 38th division air defense base near Saida, Khan Arnabah, the towns along the Golan, Dael, and the border crossings with Jordan, are all located either on roadways that link major urban centers in the south to Damascus or transnational highways to Jordan and the Golan. By concentrating on the roads that transect Deraa and al-Quneitra, the opposition in the south is pursuing a campaign similar to the one followed by its counterparts in the north. From the entrenched 4th Division and Republican Guard facilities in the Qassioun Mountains overlooking Damascus, the regime is well positioned to launch mortar and air attacks at rebel positions and stymie any direct assaults. Consequently, the opposition has chosen to chip away at regime resources in Damascus and weaken its defenses through attrition. The new battlefronts in Deraa and along the Golan contribute to this strategy by isolating Damascus from its military resources in the south and forcing it to rely on its connection to the coast through Homs. Just as rebel commanders who say recent operations in Khan al-Sheikh, Damascus province are meant to alleviate pressure on forces fighting in Daraya and al-Quneitra, these operations will force the regime to consolidate its depleting forces and limit where they will be able to deploy. [Map Point 9] The opposition in the north and south now appear to be launching similar, coordinated campaigns to seize the regime’s military facilities, harass the cities, and outlast the will of the regime. “Dera’a: a tour of the 38th brigade air defense base,” YouTube, Posted on March 23, 2013. http://www.youtube.com/watch?v=rQjy1Gbesrc; Report from field commanders to Syrian Support Group, March 2013.